Craving couscous in Tel Aviv? There are two restaurants I visited on a recent trip: Frida Hecht and Gueta, both of which serve very delicious couscous with options for vegetarians. Gueta is a family-run kosher restaurant on a main street in Jaffa, close to the clock tower. In addition to couscous, they serve other Libyan dishes. We ordered the couscous complet which comes with a meat dish and a thick spinach and white bean soup, or if you prefer, a lighter vegetable soup with pumpkin, carrots, onions, courgettes and celery. You also get spicy pickled condiments such as filfelchuma. Gueta’s dining room is a large airy place where you can sit comfortably with friends. Service is excellent. Frida Hecht is an informal tiny place on Ben Yehuda St. (a major thoroughfare that runs parallel to HaYarkon St.), with a couple of tables and a long counter by the window. It seems to be mostly a takeaway location although when I had lunch here, I saw others sitting along the counter quietly enjoying their couscous meals. 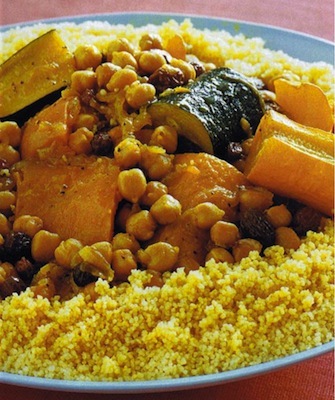 As with Gueta, the main attraction is the couscous. The mafroum at Frida Hecht is amazing: savoury spiced ground lamb stuffed in vegetables and cooked in a tangy sauce to accompany your couscous. I loved the vegetable soup at Frida Hecht, too, which is very similar to the one I had at Gueta. The food at both restaurants is not expensive so if you are going to Tel Aviv on a budget, these are excellent places to eat.